Bolivia Geography. Major Cities of Bolivia. Map of Bolivia. Geographic Facts. Geography: Bolivia is located in the heart of South America and is one of only two landlocked countries on the South American continent (the other is Paraguay). Click here to see Maps of Bolivia such as a South America outline map for school projects, an interactive map of Bolivia, and maps of each of Bolivia's states. Or click to this page to purchase a Travel Map or Bolivia guidebook. Geographically, Bolivia is surrounded by Argentina to the South, Paraguay to the Southeast, Brazil to the East and North, Peru to the Northwest and Chile to the Southwest. 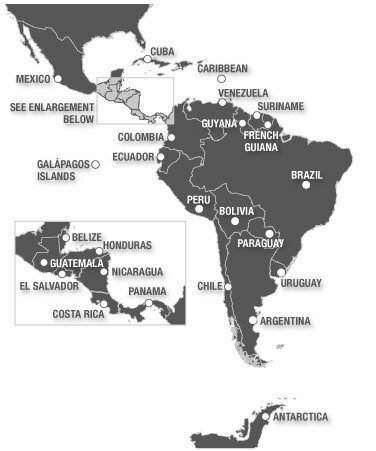 The country has three main geographic zones: the Andes mountains and "Altiplano" (high plateau) to the West; the semi-tropical Yungas (jungles) and temperate valleys descending the eastern slopes of the Andes; and the tropical lowlands which cover the entire eastern half of the country. Comparative area: roughly the size of California and Texas combined (twice the size of Spain). the Cordillera Occidental (western range) and the Cordillera Oriental (eastern range). The Cordillera Occidental is of volcanic origin. Volcanoes are currently dormant but emit sulfurous gases. The highest peak in Bolivia, the snowcapped Sajama (which rises to 6542 meters) is located here. The greater part of this range has an elevation of about 4000 meters above sea level. The entire region is sparsely populated. The Cordillera Oriental runs from northern Bolivia to Argentina and is more ancient than the western range. It contains a series of granite mountains in its northernmost section (called the Cordillera Real, or Royal Range). Many of them exceed 6000 meters and are snowcapped yearound. The Illimani (at 6322 meters - 21,184 feet - seen in this photo), which overlooks the city of La Paz when it isn't clouded over, and the Illampu (at 6424 meters - 21,276 feet) both have large glaciers. The central section of the Cordillera Oriental (or eastern range) is called the Cordillera Central. Here the land is actually a huge block of the earth's crust that was lifted up and tilts eastward. It descends gradually toward the East. Its rivers also drain in this direction making the land here temperate and fertile. 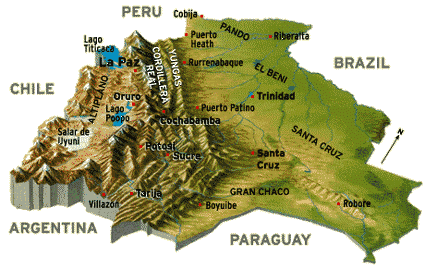 Bolivia has many VERY different geographical zones! The Altiplano stretches between the two ranges. It is 805 kilometers (503 miles) long and 129 kilometers (87 miles) wide. At about 12,000 feet above sea level, it is nearly 300 miles wide. It was originally a deep rift between the two cordilleras, but over time filled up with sediments that washed down from the peaks. Lake Titicaca, at 3810 meters above sea level (12,507 feet), is located here. It is the highest navigable body of water in the world, is South America's largest lake and control of it is shared by Peru and Bolivia. It's average depth is 215 meters, and its maximum depth is 370 meters. Visitors can cross from Copacabana to the Islands of the Sun and Moon to view ancient Incan ruins. It is a freshwater lake and drains southward through the Desaguadero River to Lake Poopó, South of La Paz, between Oruro and Potosí, which is salty and shallow, generally less than 4 meters deep. This great video of La Paz was made by my high school. The land is arid and barren with little vegetation. Several salt flats, the remains of ancient lakes that have since dried, can be found here. Called salt beds or salt pans, the Uyuni Saltpan is the largest, covering 9000 square miles. The salt is more than 5 meters deep. Tourists can spend the night in a hotel made completely out of bricks of salt. The ruins of the great Tiahuanaco Empire are also found here. Oddly, one of the most surprising attractions on the Altiplano is an extensive flock of pink flamingos! The scenery on the Altiplano is considered breathtakingly beautiful worldwide. The cities of La Paz (Bolivia’s de facto capital), Oruro (where Carnaval is celebrated each year), and Potosí (home to the world-renowned silver mines) are found in this geographical region of Bolivia. Eastward the mountains are cut through by streams and rivers forming a wide section of lush valleys, Bolivia’s most fertile region. This geographic area, still at anywhere between 8500 and 3000 feet above sea level, is famous for its coffees and teas, fruit and flora, and of course, coca. Cochabamba (Bolivia’s third largest city), Sucre (Bolivia’s capital), and Tarija (home to Bolivia’s world-famous wine country) are part of this lush valley geography and are sometimes referred to as the country’s garden spots. (This is a photo of the "Cristo", a huge statue of Jesus that looks out over the city of Cochabamba from a hill). This travel video of Sucre is in Spanish but worth watching. 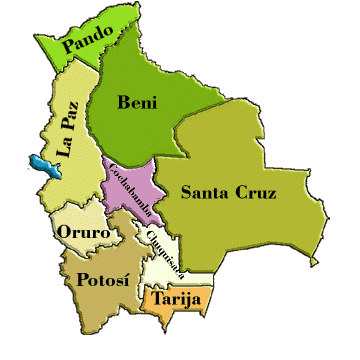 The northern region, extends over the Departments of Pando and Beni and parts of northern Cochabamba, and is covered in dense tropical rainforest. Three of Bolivia's most important rivers (the Beni, Madre de Dios, and Mamoré Rivers which flow northward toward the Amazon) are found here and during the rainy season this region frequently floods. Cobija (capital of Pando) and Trinidad (capital of Beni), both located in Bolivia’s extensive tropical forests. The central region, (the northern half of the Department of Santa Cruz) is drier with rolling hills, forests and savannahs. The city of Santa Cruz de la Sierra, Bolivia's largest city is located here, as are most of the nation's oil and natural gas reserves. This is a fantastic video of Santa Cruz, Bolivia's largest city. The southeastern region bordering Paraguay is called the "Chaco" geographic region, and is dry throughout most of the year. However, during the 3-month rainy season heavy rains turn this region into a swamp which eventually drains off into the Pilcomayo and Paraguay Rivers. Oil and gas have also been found here. 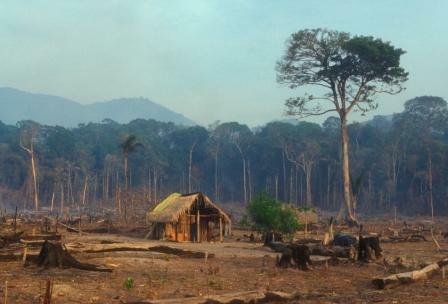 Environment - current issues: the clearing of land for agricultural purposes and the international demand for tropical timber are contributing to other more devastating changes in geography like deforestation; soil erosion from overgrazing and poor cultivation methods (including slash-and-burn agriculture); desertification; loss of biodiversity; industrial pollution of water supplies used for drinking and irrigation. Our geography is changing, but this is having negative effects on the environment as well. Read more about Bolivia geography on our Bolivia maps page. View this video on the effects land clearing and global warming are having on the Amazon region's geography. Although filmed in Brazil, the same is happening in Bolivia as well. This will not only affect our geography; it will also cause changes in our climate, water supplies and oxygen levels around the world, and not for the better. Bolivia's geography is defined by extremes, with a climate that varies with altitude from humid and tropical to cold and semiarid. The terrain ranges from the soaring, rugged Andes Mountains (the high point is Nevado Sajama at 6,542 m), to a highland plateau (Altiplano), down to hills and then the lowland plains of the Amazon Basin. The variety of plant and animal life is understandably diverse, as is the ethnic diversity of the people, making Bolivia a fascinating country for adventurous travelers.